In today’s political arena, linking the terms “environment” and “conflict” tends to be mired in controversy. Although most people agree that various conflicts have been stoked by natural resources, there are some who believe that states should be allowed to use their resources as they see fit, while others are of the opinion that, due to the extent of environmental degradation this is a matter of international concern. A UNEP report states that since 1990 the use of natural resources has fuelled close to 20 violent conflicts, whether full-blown civil wars or regional clashes involving fighting over the control of scare resources. Yet, environmental factors are rarely the sole cause. As institutional capacities are eroded, ethnic and political unrest, adverse economic conditions, and regional instability can also serve to ignite or fan the flames of smouldering tensions. However, little thought is given to the potential of the environment to make a significant contribution to peacebuilding. The sound exploitation and joint management of shared natural resources can boost economic development, thereby generating more jobs and creating new opportunities for a peaceful resolution to the conflict situation. The report issues six key recommendations, ranging from the inclusion of preventive action to the consideration of environmental factors in future peacebuilding strategies. The Initiative for Peacebuilding has published a report, dealing with water management and peacebuilding efforts. One of the case studies deals with the “Good water neighbours” project, the aim of which was to foster cooperation between Jordan, Israel and the Palestinian territories, a region with scarce water resources and major asymmetries at many different levels. The author wanted to reach a better understanding of how the project could best be supported and sustained. Inevitably, this peacebuilding initiative seeks to affect political change and to foster inter-community relations. Yet, it also generates different expectations, which need to be addressed. Access to water, though, is an expectation (and a concern) shared by all communities in the region. If cross-border cooperation is to help build peace, it must start by offering ways for the various communities to meet so as they can get to know one another and develop a working relationship built on mutual trust. For example, the joint construction of a rainwater harvesting system should help strengthen trust and promote dialogue, instead of spilling over into environmental activism. If the transformation of individuals’ perceptions of people from other communities and the relationship they have with them are to change the attitudes of society as a whole, the project needs to be spread out over many years, and to focus on activities which involve young people from the various communities (awareness campaigns, field studies, taking responsibility for specific actions). As for forests, throughout the world they are the scene of conflicts, major and minor, a fact which is made abundantly clear in the “Forests and Conflict: Facility Digest”. According to this new FAO publication, the issue deserves greater attention, since the intensity and gravity of these conflicts as well as their handling by the competent institutions have an impact on the livelihood, identity and safety of forest-dependent communities. Not only do forests provide the setting for physical battles, they are also the subject of battles, while the sale of their products, in some instances, helps to finance and ultimately to sustain these battles. A country’s governance capacity is a good indicator of how well it can manage this type of conflict, with weak states often lacking the power to bring such situations under control. This trilingual publication (English, French and Spanish), with a partly annotated bibliography, provides an overview of the current situation across the world as well as an analysis of the different types of forest-related conflicts. It also sets out instruments which could help resolve this problem. As such, the digest should serve as a valuable guide for national forest programme managers across the world. 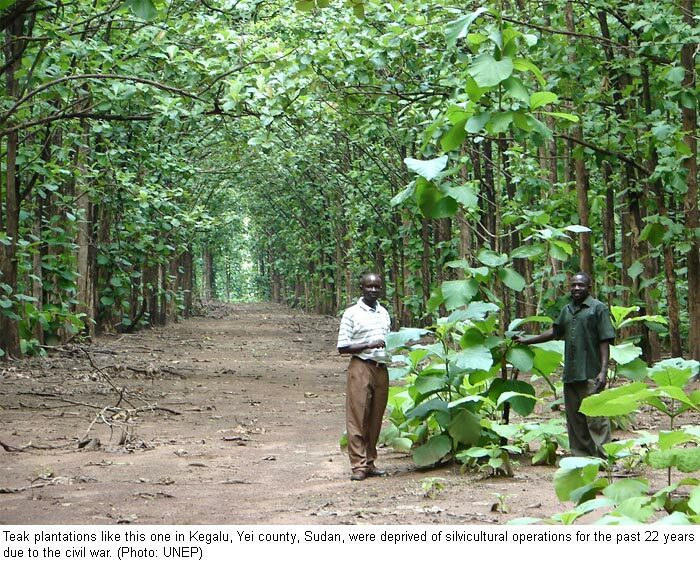 > Forests and Conflict: Facility Digest. Les forêts et les conflits : Abrégé thématique du Mécanisme. Los bosques y los conflictos: Recopilación del Mecanismo. Engel, Antonia. FAO, 2009. 59 p.
Over 800 million people today have no access to clean drinking water. This is a paradox in view of the fact that the existing freshwater reserves are actually sufficient to meet the needs. Mismanagement, social injustice and a lack of effective laws are some of the circumstances causing this situation. Experts at this year’s Fifth World Water Forum in Istanbul strongly emphasised the fact that equitable water management requires reforms, and that these need to be initiated by the governments. A new toolkit developed by IUCN offers governments a useful basis for identifying weak points and launching adequate reforms. It provides experts and government officials in the water sector with access to information that can support them in designing visionary, participatory water policies, efficient legislation, effective institutional development and appropriate enforcement of laws. This guide is useful for practitioners in that it describes and justifies the necessary steps in all various areas of activity. The “Water Policy” section, for example, contains the headings “Assess what type of water policy reform will work best given the existing government structure” and “Clearly allocate water rights among users and uses”. Political measures, legislative measures and measures of law enforcement are concerted in a consistent manner. Small and big success stories from around the world keep this guide close to reality and serve to show that reform processes can be launched even in difficult circumstances. In traditional development approaches, children are perceived as passive victims during and after disasters. In fact, however, empowered children can contribute to minimising the consequences of risks in developing countries. A recent report explores children’s voices in disaster risk reduction (DRR) and their capacity to communicate disaster risks to their parents and larger community. Supported by field research in El Salvador and the Philippines, the report investigates three related areas of enquiry that help to frame the emerging child-centred approach to DRR. First, it considers a history of youth empowerment through children’s active participation in decision-making forums. Second, it looks at whether the international human rights architecture provides for a child’s right to protection from disasters; and third, it examines whether children can be effective as communicators of risk within their own households and communities. While acknowledging that there is not yet enough evidence to present conclusive results, this research indicates that informed young people, including children, can play a crucial apolitical and trusted role in communicating risk to adults and peers, and dispelling long held beliefs. Between 1990 and 1992, when work was under way on the original ITTO (International Tropical Timber Association) biodiversity guidelines, many conservationists still regarded logging in tropical forests as the main threat to tropical biodiversity. At that time, instruments to guarantee the sustainable mangement of tropical forests, like conventions, special funds and certification, had yet to be formulated. Nowadays, tropical timber production and the redistribution of the income that it generates are decisive to the sustainability of forest ecosystems. While there is widespread recognition of the rights and knowledge of local and indigenous peoples, much is still unknown about the impact of the use of genetically modified organisms and the resilience of forest ecosystems to climate change. These updated guidelines contain a wealth of practical advice for decision-makers at all levels, business and community leaders, as well as local forest managers. Yet, incentive measures are still needed to keep implementation costs at an acceptable level, to support training programmes, to develop biodiversity expertise and to mobilise international support. The experiences of the Danish International Development Agency (DANIDA) in the Sahel show that ecological, social and economic change calls for new strategies in this region that is highly dependent on natural resources. Focusing on poverty alleviation, this publication points out several important aspects that need to be considered. The authors state that in recent years the vegetation cover has, on the average, increased. This contradicts the presumption of ongoing degradation. However, climatic variability is on the increase. Promoting early warning systems and building capacity to react to natu- ral disasters must therefore be a priority. Natural resource governance is another important topic. Decentralisation failed to yield expected results in this respect. In many cases, new legal systems did not efficiently integrate traditional systems, although these continue to exist and function. Moreover, water management must take place at the watershed level. However, top-down implementation of this approach means that marginal population groups are not sufficiently considered. This publication also addresses other questions, such as, for example, market development and land rights. The authors clearly distinguish between research needs and strategic priorities for each topic. For a long time, agricultural research and extension for developing countries was a one-way road. Only towards the end of the 1980s the view gained ground that farmers should set the agenda jointly with researchers. The “Farmer First” workshop organised by the Institute of Development Studies (IDS) in 1987 is considered a milestone in this respect. 20 years later, representatives of the research community, farmers’ organisations, government agencies and the private sector met for a follow-up workshop, where they took stock of participatory methods implemented so far and discussed future challenges. The contributions in this publication offer a comprehensive overview of many diverse forms of farmers’ participation in innovation processes. They address participatory research as well as cooperation with the private sector and network-building. The conclusion is that while many efforts were indeed successful and contributed to strengthening the role of farmers, research initiatives nevertheless frequently remain driven by supply rather than demand, with participatory approaches more of a decoration than a core element. In future, implementation should concentrate on demand-driven systems of innovation that can accommodate farmers, researchers, private-sector entrepreneurs and other actors. However, this can only work if all parties involved are open to dialogue and to political debate. The goal of the Convention on Biological Diversity (CBD) and the International Treaty on Plant Genetic Resources for Food and Agriculture (ITPGR) is to conserve biological diversity and local knowledge, to use biological diversity in a sustainable fashion and to share the benefits of biological diversity and local knowledge fairly and equitably. However, implementing these international agreements is not easy, particularly when there is a lack of knowledge at the local level about the issues at stake. The present training manual is an attempt to fill this gap by training trainers. The publication offers advantages at two levels. On the one hand, coaches are given detailed instructions how to organise and run a course of 20 lessons in 5 days, how to establish contact with participants, how to motivate them to contribute in an active manner, and which learning methods and tools are needed. On the other hand, this manual offers an excellent and easily understandable summary of the CBD and the ITPGR, including their structures and mechanisms. Alongside detailed information on the terms of biodiversity and local knowledge, the manual also contains a glossary. Even though this manual was developed for the Himalayan region, it is also very well applicable in diverse contexts and can easily be updated due to its modular structure. Today, 1.6 billion people still live without access to electricity. As a consequence, they are unable to take advantage of many useful products and services. Small-scale bioenergy initiatives have shown a potential to improve energy supply and the general living conditions of these population groups. A recent study presents 15 initiatives implemented in very diverse contexts. In the commune of Garalo in Mali, for example, small-scale farmers have replaced their cotton cultures, which had become unprofitable, with the oil plant jatropha. They supply a local electricity producer with jatropha oil. 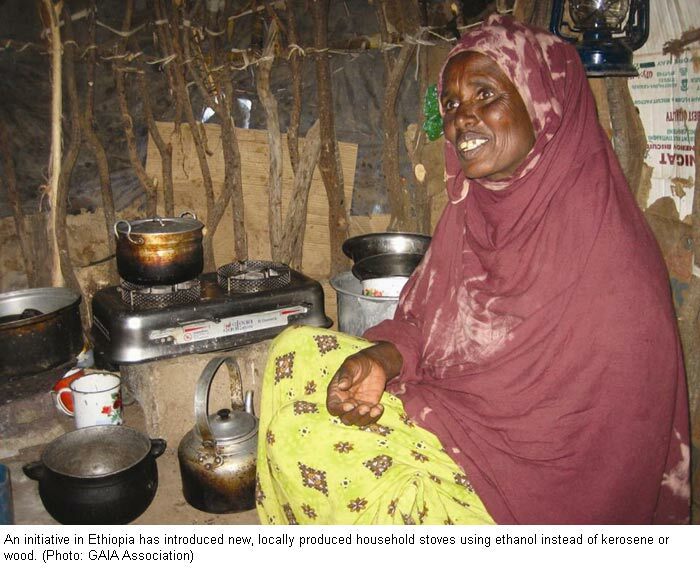 The oil is transformed into electricity, which is sold to local businesses and private households. This setting grants farmers a more reliable income and improves energy supply in the community. Generating value added chiefly within the local community helps to enhance both income and employment opportunities. At the same time, many projects have produced positive ecological impacts: the forms of energy used in the projects are frequently cleaner than those used before, and environmentally risky waste products are put to use as a source of energy. However, the success of these projects largely depends on external factors, such as enabling political and legal conditions and, to an important degree, fossil fuel prices. Many of us have heard of discussion forums and so-called “communities of practice” in the context of the Internet. But who knows that the “Fish Bowl” method encourages integration of the audience in small discussion groups, or that “Moodle” is the name of a web-based learning management system that is available for free on the Internet? More than 60 tools and methods for knowledge sharing are presented and commented on in the “Knowledge Sharing Toolkit” – an interactive website in the form of a Wiki. The toolkit contains small illustrative films and information about experts. In addition, it offers indications of which tool or method is best suitable in a specific context. There are links to further reading, as well as a protected environment for registered members of the Wiki. Although some information is available in French or Spanish, the vast majority of contributions is in English. Maca is a domesticated edible root endemic to central Peru. Traditionally, dehydrated maca is used in soups and blended beverages. Until the 1980s maca was cultivated only in its native area, on about 50 ha, and mainly for household consumption. Very few sources providing authentic information on indigenous knowledge mention that maca is said to have invigorating and fertility-enhancing effects. Bioversity International and the International Potato Center have conducted a study on maca to describe its cultivation and market expansion, as well as constraints to market chain development. In the 1980s, various local actors began to promote the health benefits of maca, initiating a spectacular rise in demand and price over the past 20 years. 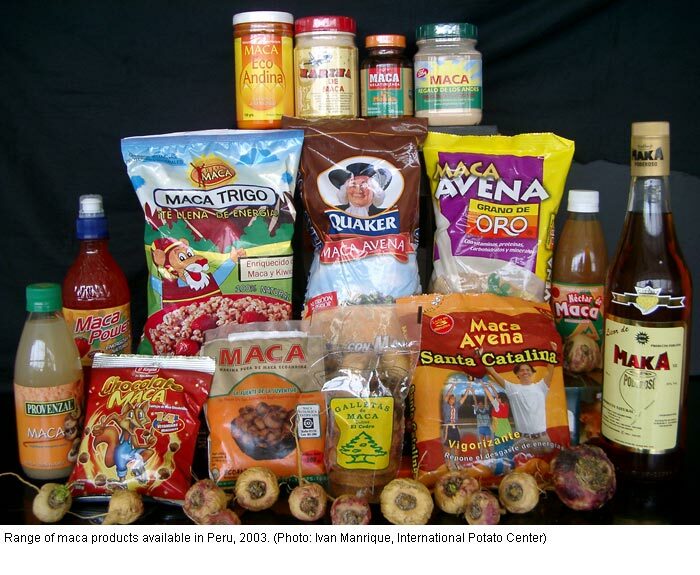 Product development and diversification played a key role in the expansion of maca demand. Supported by government policies, production in Peru grew by a factor of 60. Interest in the crop’s attributes increased, as did the number of studies attempting to scientifically prove them. However, the drastic expansion of production eventually resulted in an oversupply and subsequent price collapse in 2001, hurting many farmers. Moreover, the wrong positioning of maca as a substitute for Viagra by informal exporters contributed to a confusing picture of the product. From these experiences the authors derive lessons with regard to enhancing market development of similar neglected crops. A scientific assessment by the Global Forest Expert Panel (GFEP) identifies major gaps in current knowledge of the impact of climate change on forests and their communities and aims to contribute to the development of adaptation strategies. According to the authors, a fundamental re-think is urgently needed with regard to governance and forest management policy. The latter, for example, must be sufficiently flexible to enable the adoption of an adaptive co-management approach. In addition, given that the outcome of many of the adaptation strategies undertaken to date are as yet unknown, it is important that there is an acceptance that mistakes will be made, but that future policies take on board the lessons learnt from such experience and endeavour to rectify them. This work will require greater commitment from the scientific community, managers, decision-makers as well as the general public and forest communities. Nevertheless, these measures alone will not improve the ability of forests and their communities to adjust to climate change. If we are to safeguard their adaptive capacity, deforestation and the resulting emissions must also be monitored very closely.